It takes ongoing vigilance and management of change to identify conditions in your plant that might cause a potential safety problem. Combustible dust explosions are a risk in many areas of an industrial plant, and one of the likeliest locations for an explosion is in the plant's dust collection system. To minimize the chance of an explosion, the NFPA sets standards to protect industrial facilities, and OSHA is tasked with enforcing these standards. A range of problems can contribute to explosion risk, but some common denominators exist. This article describes frequently encountered shortfalls to compliance and how you to avoid them. "I've worked here for 30 years and we've never had a problem" is a frequently heard refrain. This mindset stems in part from a common misconception that the dust is not explosive because the facility has not had an event – when, in fact, the opposite may be true. In some cases, it may take many years for dust to accumulate to explosive levels. To understand the risks, it is necessary to review the five elements comprising what is known as the "dust explosion pentagon." They are: (1) combustible dust; (2) an ignition source; (3) oxygen in the air; (4) dispersion of the dust in sufficient concentration to be explosive; and (5) containment of the dust cloud within a confined or semi-confined vessel or area. All five of these elements may exist in an industrial facility, but all must be present at the same time for an explosion to occur. If there is no containment, it is still possible for a flash fire to erupt if elements 1-4 are present simultaneously. In a closed vessel such as a cartridge dust collection system, an explosion typically begins when an ignition source enters the dust collector. This ignition source can come from many things and is never identified in most cases. When a pulse cleaning event occurs, a suspended cloud of combustible dust is present in high concentration within the collector. This completes the five elements of a dust explosion and initiates the explosion. Though some incidents involve a single explosion, it is more common for a series of deflagrations to occur. The initial explosion can dislodge ignitable dust hidden on overhead surfaces or other areas over a large area and trigger secondary explosions that can be ignited from the initial explosion or from other ignition sources. It is these secondary explosions that have historically caused the majority of injuries and damage to property. How do you know if your facility is at risk? Even if there has never been a problem before, this is no guarantee of future safety. The level of hazard can change from day to day and even from moment to moment, whether due to the introduction of a new process, a temporary lapse in housekeeping, or a static electricity discharge caused by improper grounding. It takes ongoing vigilance and management of change to identify conditions in your plant that might cause a potential safety problem. Failure to conduct a hazard analysis is an all-too-common oversight. The NFPA states that a hazard analysis is needed to assess risk and determine the required level of fire and explosion protection. The analysis can be conducted internally or by an independent consultant, but either way, the authority having jurisdiction will ultimately review and approve the findings. Regarding explosion protection, the first step in a hazard analysis is determining whether your dust is explosive. Many commercial test laboratories offer a low-cost test to establish whether a dust sample is combustible. If the test is positive, then the explosive index (Kst) and the maximum pressure rise (Pmax) of the dust should be determined by ASTM E 1226-12a, Standard Test Method for Explosibility of Dust Clouds. Your dust collection equipment supplier will need the Kst and Pmax values in order to correctly size explosion venting or suppression systems. Failure to provide this information will increase your costs because the supplier will have to use worst-case estimates of the Kst and Pmax values or may even refuse to provide the equipment. The liability to the manufacturer and to the equipment purchaser is too high to ignore the life safety objectives. The fact is, any dust above 0 Kst is considered to be explosive, and the majority of dusts fall into this category. 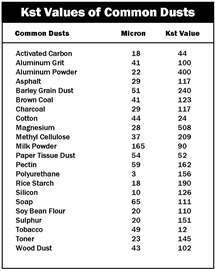 If OSHA determines that even a very low Kst dust is present in a facility with no explosion protection in place, a citation will result. This is one of the biggest changes to occur with the reintroduction of the OSHA Combustible Dust National Emphasis Program (NEP) in 2008. Every EHS manager is acquainted with the benefits of basing purchasing decisions on life-cycle cost--sometimes called "total cost of ownership"--over choosing equipment with the lowest price tag. A dust collector is no exception. A well-designed dust collection system can pay for itself rapidly in energy and maintenance savings, costing far less to operate than a unit with a low initial price. A high-quality, heavy duty collector also can offer a less-obvious advantage in the event of a combustible dust problem. As documented both in full-scale testing and field experience, in the event that a dust explosion occurs in the collector, a "bargain" model will more than likely require total replacement. However, a collector made of thicker-gauge metal with higher vessel strength will survive an explosion and often can continue in service with only the explosion vent and filter cartridges needing to be replaced. Bargain-hunting also can lead to the use of non-compliant or uncertified explosion protection devices. Sometimes products such as back flap dampers may be reverse-engineered by suppliers that do not have any expertise in explosion protection or have chosen not to perform the required testing to satisfy the standards and/or the performance-based provisions. No testing exists to prove that the device will comply with current standards. If an OSHA inspector finds this situation in the field, the plant will have to replace the device and may be subject to a fine. Worse yet, if a combustible dust problem should occur, there is no guarantee that the device will perform as expected. It is also worth noting that there is no such thing as an "NFPA-approved" device. A supplier may correctly state that a device "carries CE and ATEX certifications" and/or is "manufactured in accordance with NFPA standards," but test data must be available to support these claims. Such a device might cost more than its non-compliant counterpart, but in the long run it can save money, headaches, and even lives. In an October 2011 update on the Combustible Dust NEP, OSHA reported that one common violation encountered during inspections involved "hazardous levels of dust accumulation in the workplaces due to poor housekeeping practices." In the authors' experience, as a rule of thumb, if an OSHA inspector can run his finger across a dusty surface or see a footprint, that is considered a citable condition. Diligent cleanup of floors and work surfaces is still not enough if more-elevated areas are neglected: Dust that accumulates on rafters and other horizontal overhead surfaces, or on top of machinery, is a frequent culprit. In NFPA 654, hazardous surface dust is defined as any dust layer of 1/32 inch (0.8 mm) or greater. When it comes to the dust collector, a simple but important housekeeping requirement is to change filters when airflow through the system reaches a differential pressure limit as prescribed by the manufacturer or when the pressure drop across the collector is negatively affecting the ability of the dust collection system to capture the dust, thus allowing it to escape into the facility. Some long-life cartridge filters available today can operate for two years or even longer between change-outs, but for heavy dust-loading applications, filter replacement might be considerably more frequent. Also, use of a listed portable vacuum helps keep the surrounding area free of spilled dust and surface dust. Use of compressed air to control dust is permitted only under certain conditions because it can increase the hazard by creating a combustible dust cloud. Another housekeeping misstep is storing dust in the dust collector's hopper. The hopper should be equipped with a device that discharges the dust into a separate drum or storage container after it is pulsed off the filters during the cleaning process. Equally important, this storage container must be emptied regularly or dust can back up into the hopper. Dust sitting in a hopper creates a potential fire or explosion risk and may also affect performance of the dust collection system. This will lead to loss of airflow, which will reduce conveying velocities, allowing buildup of dust in the ducting and emissions of dust at the process hoods. There is a misconception that open type dust collection systems, such as those incorporated into bag-dump stations, downdraft tables, and booths, are not a hazard. While these collectors differ from traditional dust collectors because they do not take the form of a tightly contained vessel, at least four of the five ingredients of the explosion pentagon may still be present: combustible dust, an ignition source, oxygen, and dispersion of the dust in sufficient concentration to pose a hazard. Thus, there is still a risk of flash fire directed by a pressure front --a potentially fatal risk, given that workers are in close proximity in these environments. If you are using an open type dust collector, you must still test and evaluate the combustibility of the dust and equip the area with fire and/or explosion protection equipment as required. The problems described above involve not doing enough in one way or another. But sometimes safety engineers err on the side of doing too much--the error of over-engineering or over-specification, which results in explosion protection solutions that may be needlessly expensive and time consuming to maintain and monitor. The NFPA uses relatively conservative textbook calculations in its standards for explosion protection equipment, and justifiably so. However, the NFPA also allows real-world destructive test data to be used in place of its own standard calculations, provided the dust collection supplier can provide adequate data to prove the collection system is designed to meet a specific set of criteria for a given situation. The use of real-world destructive test data is thus a permissible and sometimes overlooked strategy. An example is actual explosion testing of a dust collector to show that it will stand up to anticipated pressure conditions, instead of using the reduced pressure calculations in NFPA 68. By combining field testing and full-scale dust collection laboratory test apparatus to prove certain assumptions, this approach might allow you to install longer duct lengths in a given application; to use a single explosion vent where multiple vents might otherwise have been needed; or even to use explosion venting in place of a more costly chemical suppression system. Find out whether your dust collection supplier can provide real-world test data to assist in a strategy that may help you to avoid over-engineering and save on equipment costs without compromising safety. 1. ASTM International, 100 Barr Harbor Drive, PO Box C700, West Conshohocken, PA, 19428; www.astm.org; "ASTM E 1226-12a, Standard Test Method for Explosibility of Dust Clouds," 2012. 2. National Fire Protection Association (NFPA), 1 Batterymarch Park, Quincy, MA 02169; www.nfpa.org. 3. Occupational Safety & Health Administration (OSHA), 200 Constitution Avenue, Washington, DC 20210; www.osha.gov. This article originally appeared in the March 2014 issue of Occupational Health & Safety.